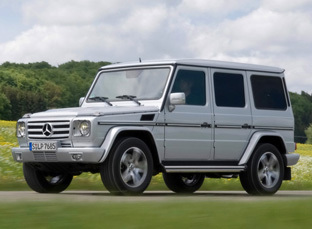 The Mercedes-Benz G55 AMG features a 507 hp supercharged V8. 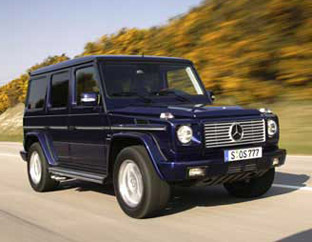 For 2009 G55 AMG was given a fresh look, incorporating a reworked radiator grille and new 19-inch AMG light-alloy wheels. 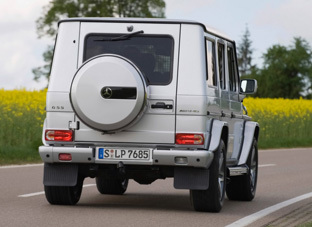 The interior of the G55 AMG features the latest generation of Mercedes-Benz telematics equipment and optional climatised seats in combination with designo leather upholstery for enhanced passenger comfort. The seats are colour-coordinated with the decorative wood trim as well as the wood/leather steering wheel and the wood/leather selector lever bearing a G 55 logo. The standard equipment COMAND APS system in the G55 AMG boasts a high-definition 6.5-inch colour display, rapid HDD navigation with aerial view, LINGUATRONIC for controlling audio, navigation and phone systems, a 4 GB memory for music files, and a slot for SD memory cards. Also available as an option is a DVDchanger and a universal interface for plugging in USB sticks, iPods, or other external audio devices.